The Alfa Romeo Stelvio Quadrifoglio sets a new benchmark in the premium midsize SUV segment with its combination of awe-inspiring design, performance and technology and is priced from €118,795. The Stelvio Quadrifoglio is powered by an innovative 2.9-litre V6 Bi-Turbo petrol engine, combined with the innovative Q4 all-wheel drive system, to offer a potent combination of unbeatable performance, traction, driving pleasure and safety in all situations. In normal conditions, the Q4 system transfers 100 percent of the torque to the rear axle. As the wheels approach their grip limit, the system transmits up to 50 percent of the torque to the front axle in real time, by means of a transfer case. 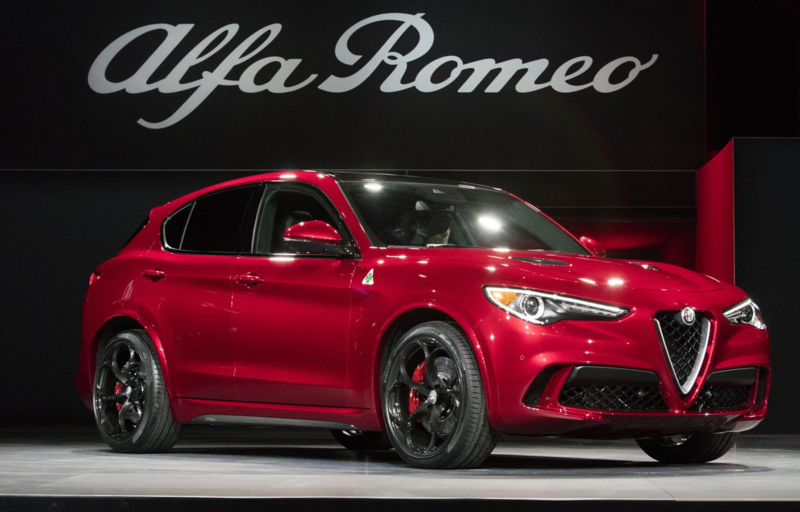 The Alfa Romeo Stelvio Quadrifoglio is equipped with the exclusive AlfaTM Chassis Domain Control unit, which acts as the brain to coordinate all the car’s electronic systems, to deliver the best performance and the utmost driving pleasure at all times. The system simultaneously assigns specific tasks to the various active systems, such as the AlfaTM DNA Pro selector, Q4 all-wheel drive, AlfaTM Active Torque Vectoring system, AlfaTM Active Suspension system and the ESC. The standard Torque Vectoring technology optimises the Stelvio Quadrifoglio’s drive distribution and accentuates its sporting character. The two electronically controlled clutches in the rear differential make it possible to control torque delivery to each wheel separately. This ensures the optimal transfer of power to the ground even when the car is pushed to its dynamic limits, without the need for intrusive inputs from the stability control system. The 2.9 V6 Bi-Turbo petrol engine in the Stelvio Quadrifoglio led the car to set a new lap record at the legendary Nurburgring. Delivering maximum power of 510hp at 6,500rpm and generation a maximum torque of 600Nm from 2,500 to 5,000rpm, the car is capable of sprinting from zero to 100km/h in just 3.8 seconds and on to a top speed of more than 283km/h, helping it to achieve a lap time of just 7minutes 51.7 seconds. This power plant is teamed with a specifically calibrated eight-speed automatic transmission that allows gear shifts in just 150 milliseconds in Race mode. The new Alfa Romeo Stelvio Quadrifoglio is priced from €118,795. For more details about the Alfa Romeo range please visit www.alfaromeo.ie.